I Think My Child is Going to College With His Froggy! When I was a kid I had a blanket. It was a pastel plaid blanket with fringe that I would twirl in my hands. I loved this blanket and brought it with me everywhere! … my son has one particular little blanket that he can not live without. I got it as a baby shower gift from my husband’s cousin. 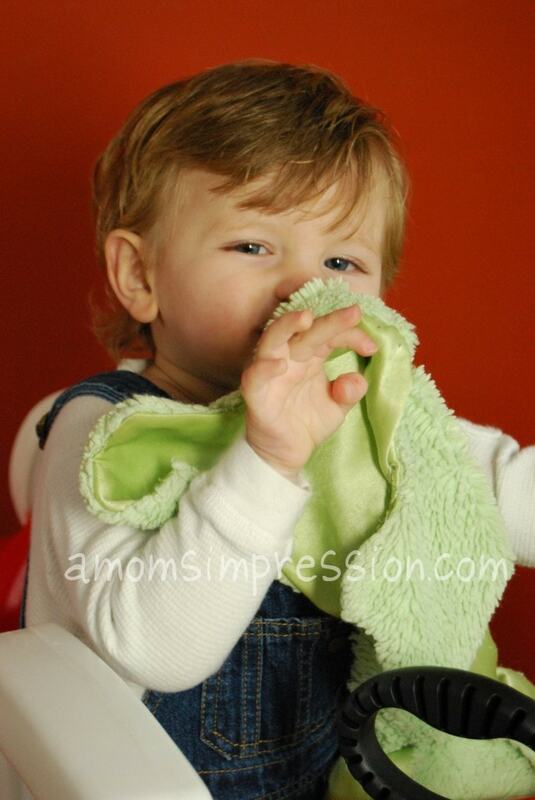 It is a babyGUND green froggy HuggyBuddy. Over the course of the past three years we have had Froggy (the First), Froggy #1 and Froggy #2. Froggy the First, was left at Target and was never to be seen again (I went several times to be sure that no one turned him in). Jonah was so upset, and had a hard time sleeping until Froggy #1 came Fed Exed by Grandma. Because of this event, grandma decided that we should have a spare in case something happened to Froggy #1, so Froggy #2 came about a month later. Luckily, we haven’t had any more accidents with Froggy and he lives by my child’s side constantly. I am beginning to think that Froggy might go to college with my son! When Caroline was born, Jonah would sometimes share Froggy #2 with her, but I wanted to find something special just for her. Of course, I had to turn to GUND to find that special lovey. I was excited to see that they still have the little blankets that my son adores so much, but they have added a few new styles. For more than a century, GUND has been creating unique teddy bears and plush toys recognized worldwide for their quality and innovation. babyGUND offers a complete line of products for infants and toddlers; from the softest imaginative toys, to a wide variety of products encouraging developmental play and to help little ones grow. We received the bumble bee blanket a few weeks ago, and I am so completely excited about it. It is extremely soft and perfect for Caroline. I love the bug theme as it would work perfectly for either a boy or a girl! The underside of the buddy is satin making it a perfect security blanket like my son’s was for him. HuggyBuddy’s are approximately 21″ long and 12″ wide, and retail for about $25. Like I said, we received our first one at my baby shower, and it was absolutely perfect! 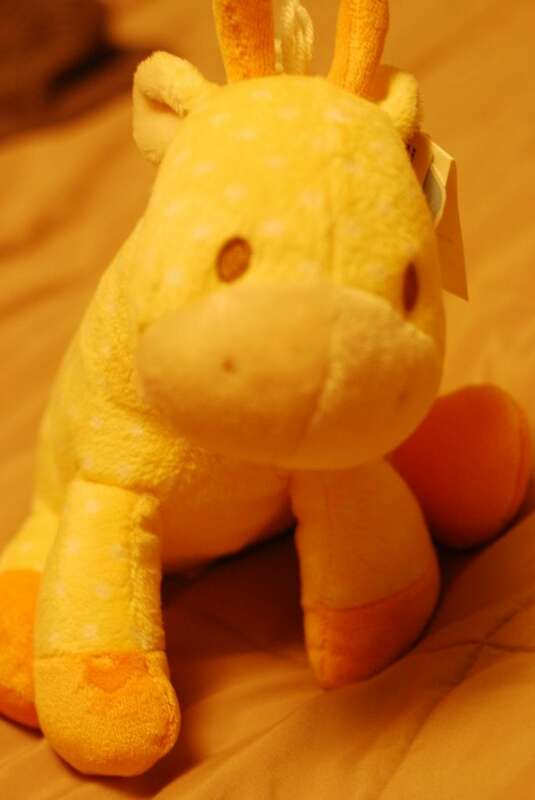 We also received Lolly Giraffe. Just like a classic musical toy, the giraffe needs to be wound by a turn of a key and “Hush Little Baby” plays softly for your little one. As she plays the song her head moves. She is a perfect color yellow with a mane of cream-colored yarn, perfect for any nursery! My son loves to turn the key for Caroline. She will sit there and watch Lolly’s head move around. Lolly Giraffe retails for $3o. If you are looking for a perfect baby shower gift check out BabyGUND. Be sure to follow GUND on Facebook, Twitter and Pinterest for the latest news and information. Does your child have a security blanket or animal? I would love to hear your stories…. please tell me they didn’t end up in college with it! A huge thank you goes out to GUND and Child’s Play Communications for sending us toys for purposes of this review. I was not compensated for this article. All opinions are 100% mine. That’s cute. Our Emma is the same way except hers is/was a blanket named “sucky blanky” … she’s 3 1/2 and still take pieces of it wherever she goes. I love the name!!! I wish I still had mine to carry a bit of when I need it. My daughter’s favorites vary from day to day so if anything it’ll be the whole toy box heading to college with her. We’ll have to have the giraffe! It’s one of the themes to the baby’s room! Love Gund! My 19 year old did take her “kitty blankie” to college with her! Of course it is more shreds of fabric at this point, since it was so loved it disintegrated.